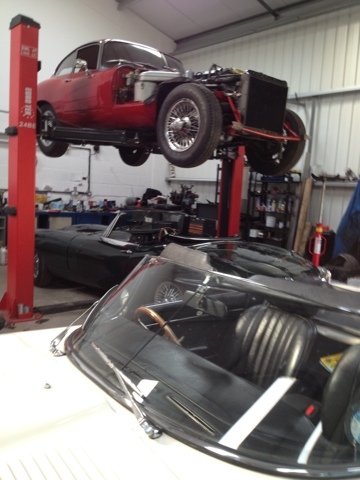 Great Escape Classic Car Hire has completed a major mechanical overhaul of its popular 1969 Jaguar E Type coupe. The work was done entirely by the company's in-house workshop over 10 days. The E Type required a new clutch double-quick time in order to keep its time off the road and off hire to a minimum. This is a popular car and we needed to avoid inconveniencing customers through a lengthy repair process. As we have our own workshop and mechanic it means we can prioritise the work and repair the car to our own timescale, rather than trying to fit it into the schedule of a busy specialist garage. Consequently we can get it back on hire faster, which benefits our customers. One other advantage is that we can effect the repair at a much lower price. Had we taken the car to a specialist we would have paid over £3,000, a considerable sum to find at short notice. Having our own workshop makes the repair much more viable to complete immediately. The clutch repair required removing the engine, a major and very physical taak. While the engine was out we decided to tidying up the engine bay and bonnet to make the car's cosmetics more attractive to hirers. The engine, ancillaries and chassis were all painted and minor corrosion rectified. We checked the condition of the flywheel and decided to refit the original as we could only source an alloy replacement at short notice. Waiting for a steel replacement would have meant further delays and inconvenience for customers. The car was repaired within 10 days. This meant that some customers had to switch their hires to one of our convertible E Types. Fortunately we have 6 E Types on the fleet, so we are able to do this, and the variable Uk weather played its part with some warm weather ideal for open top motoring. This major job proved the value ofbour in-house facility and large fleet, which helped maintain customer satisfaction in an unavoidable breakdown situation. Very nice blog and also all of your blog thing such as pic's and information etc. Due to the countdown pretty much started for upcoming summer’s 2012 Olympics in London, UK, this is the ideal opportunity to get the best Cars Rentals in UK at the affordable prices.